It's holiday time gang, which means it's time to get in the spirit and spread some Christmas cheer. One of my work buddies (and original blog inspiration) is hosting a super little thingy called Cans for Comments. Just hop over to her blog, Dillypoo Chatter, and read all about it. For every comment left on her blog, she'll donate a can of food to our local food bank. It's a cool thing, and all you have to do is just go over and leave her one measly little comment. Hop on over soon, she's cutting off the comments December 15, this Wendesday! 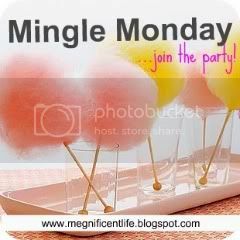 On another blog hop note, don't forget about Mingle Monday, one of my most favorite-est times of the week! Hi! I've hopped from Megs Mingle Monday. What a super blog. I'm off to comment on your friend's blog for a can of meat...for a dog, not for me or Hubby of course: I have added myself as your newest follower on GFC .